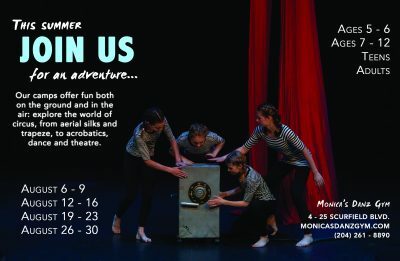 Join us this summer for an acrobatic adventure! For ages 6 – 12 years old. 9 AM – 4 PM. For ages 5 – 6 years old. 9 AM – 12 PM. For ages 13 – 17. 1 PM – 4 PM. Wear comfortable clothes that are easy to move in. Please, no zippers or buttons (they like to eat our equipment.) We recommend leggings and a tight t-shirt. Gymnastics + dance wear welcome. Parents may choose to drop off students 30 minutes before camp starts (as early as 8:30 AM) and pick up as late as 4:30 PM at no additional charge. EARLY BIRD PRICES available until April 15. $225. Full Day. $150. Half Day. $150. Teen. Calling all superheroes in training – this week is for you! Hone your skills and come fly with us. You may just discover a super power you didn’t know you had! Step into the world of some of your favourite Disney films in this whimsical week. From Tarzan to the Lion King, the classics are making a comeback and you’re invited to the party. $275. Full Day. $200. Half Day. Welcome to the days of future past, where old meets new and possibilities abound. $275. Full Day. $200. Half Day. $200. TEEN Half Day. Accio, wand! Step away from the muggle world for a week of fun inspired by the magical world of Harry Potter. We’ll play Quidditch, drink butter beer, swing from the aerial silks and so much more! Wands optional. $275. Full Day. $200. TEEN Half Day.